The discovery of the Mesazoic-era vocal organ–called a syrinx–and its apparent absence in nonavian dinosaur fossils of the same age indicate that the organ may be have originated late in the evolution of birds and that other dinosaurs may not have been able to make noises similar to the bird calls we hear today, according to findings published in Nature on Oct 12. Birds are direct descendants of dinosaurs and are considered living dinosaurs by scientists. 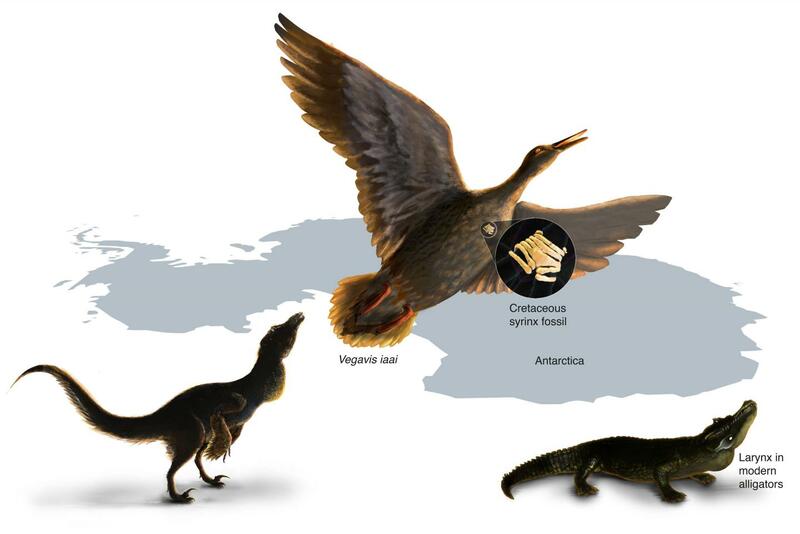 "This finding helps explain why no such organ has been preserved in a nonbird dinosaur or crocodile relative," said Julia Clarke, a paleontologist at The University of Texas at Austin Jackson School of Geosciences who discovered the fossil syrinx and led the analysis. "This is another important step to figuring out what dinosaurs sounded like as well as giving us insight into the evolution of birds." The syrinx is made of stiff, cartilage rings that support soft tissues that vibrate to produce the complex songs and calls of modern birds. Cartilage does not fossilize as well as hard tissues such as bone. But the high mineral content in the syrinx's rings sometimes allows for fossilization. All other known examples of fossilized syrinxes occur in birds that lived well after nonavian dinosaurs went extinct. The syrinx was found in a fossil of Vegavis iaai, a bird that lived during the Cretaceous. Clarke described the species in 2005. It was discovered on Antarctica's Vega Island in 1992 by a team from the Argentine Antarctic Institute. However, it wasn't until 2013 that Clarke noticed that the Vegavis fossil included a syrinx. During the past two years, the team searched the dinosaur fossil record for other examples of a syrinx, but so far has found none. "Here, we begin to outline how fossilizable characteristics of the syrinx may inform us about sound features, but we need a lot more data on living birds," Goller said. "Remarkably, prior to this work, there is almost no discussion of these important questions." This study follows research that Clarke and other collaborators published in July 2016 that found some dinosaurs would likely have made closed-mouth vocalizations akin to ostrich booms that don't require a syrinx. Together, the two studies have major implications for dinosaur sound-making throughout time, Clarke said. "The origin of birds is about so much more than the evolution of flight and feathers," Clarke said. Other collaborators on the most recent study include Zhiheng Li, a former Jackson School graduate student and now a professor at the Chinese Academy of Sciences, Key Laboratory in Paleontology and Paleoanthropology; Tobias Riede of Midwestern University in Arizona; Sankar Chatterjee of Texas Tech University; and Fernando Novas and Federico Agnolin of the Museo Nacional Bernardino Rivadavia.. The study was funded by the Gordon and Betty Moore Foundation, the National Science Foundation Office of Polar Programs, and the Agencia Nacional de Promoción Científica y Tecnológica.